Fig. 72 Profit-and-loss account. Profit-and-loss account of Y Co for year ending 31 December 20xx. An accounting statement that shows a firm's SALES REVENUE generated over a trading period and all the relevant costs experienced in earning that revenue. 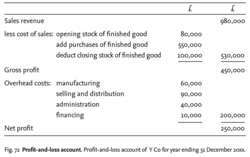 In the account, the COST OF SALES is deducted from sales revenue to calculate GROSS PROFIT; then the other costs involved are deducted from the gross profit to show any NET PROFIT earned. In effect, the profit-and-loss account provides a summarized financial video-recording of the firm's trading activities. Fig. 72 shows the typical layout of a profit and loss account. See also VALUE ADDED, ECONOMIC VALUE ADDED. an accounting statement that shows a firm's SALES REVENUE generated over a particular period and all the relevant EXPLICIT COSTS incurred in earning that revenue. In the account, the COST OF GOODS SOLD is deducted from sales revenue to calculate GROSS PROFIT, then the other costs involved are deducted from the gross profit to show any NET PROFIT earned.